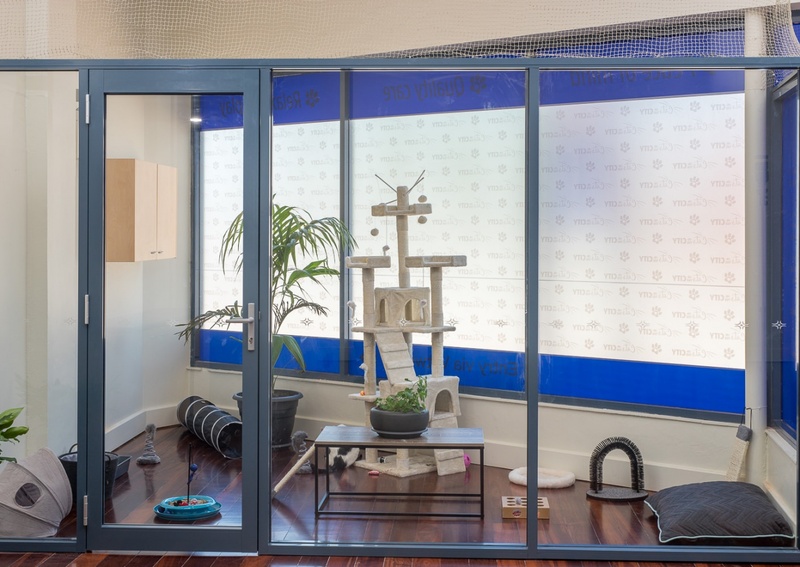 Our brand new cat boarding facility in South Perth is designed for cats to have a relaxing, enjoyable and safe experience while you’re away. All while in the complete care of our Vetwest healthcare professionals. Have complete peace of mind that your cat will receive first class care throughout their stay in our dedicated cat boarding facilities. Our healthcare team including qualified veterinary nurses and veterinarians are always nearby and on hand to help. If your cat is on medication we will continue treatment as instructed. 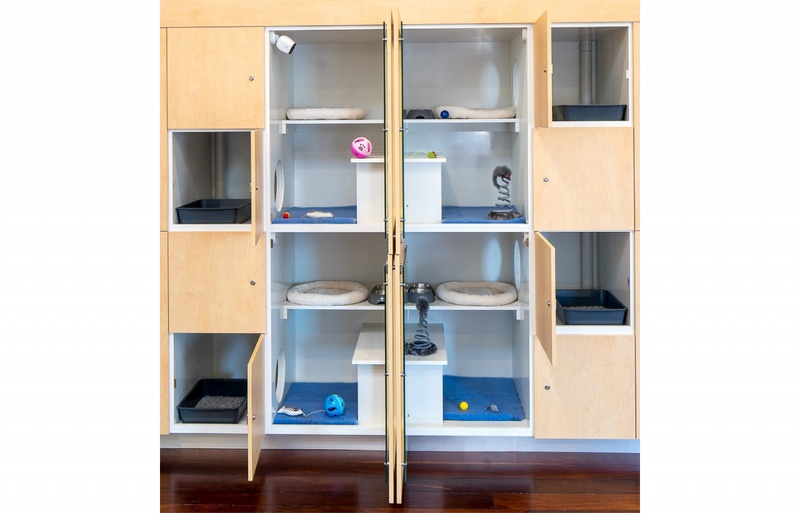 Your cat will have a range of room options to choose from suiting your budget and their personal requirements. Each suite has separate areas for sleeping, scratching and toileting with lots of room to move around, stretch and play. 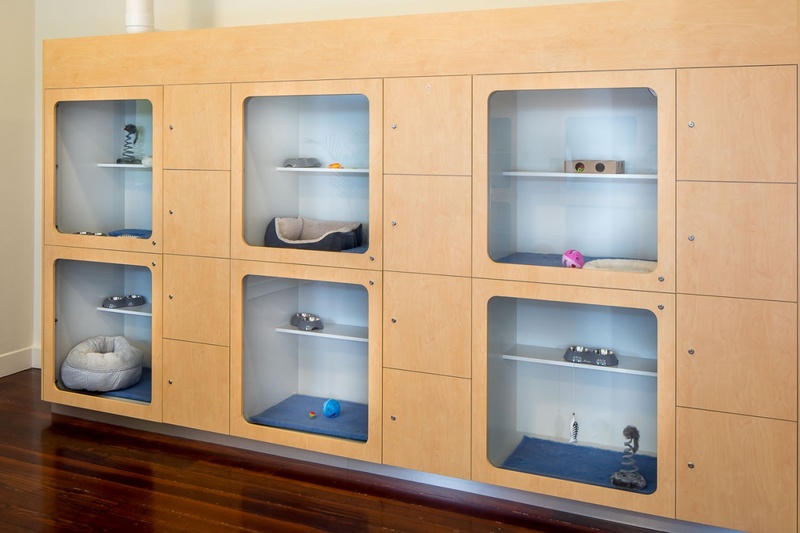 Choose from standard, premium and deluxe suites with options for multiple pets to board together. Standard - Our standard suites are cosy and comfortable and offer all the essentials to ensure your cat has a relaxing stay with us. Suitable for a short stay they feature a private litter tray area. Suitable for single cats only. Premium - Our premium suites offer an executive size for cats who demand more room than the standard suite or will be staying a bit longer with us. 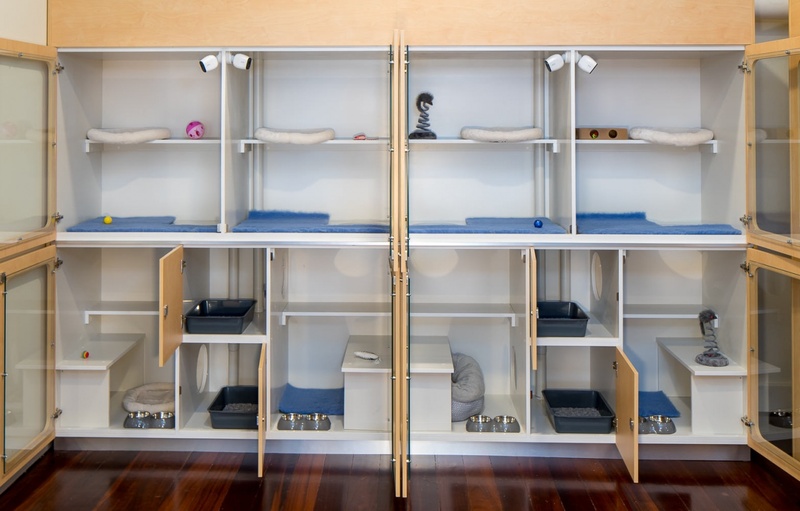 Our premium suites offer a private litter tray area, a separate larger sleeping area and can house 2 cats from the same household. Deluxe - The deluxe suite is the 5-star experience for your cat. Suitable for short, medium and long-term stays, this is our largest condo available. It has a private litter tray room, separate sleeping area and an upstairs playroom. Suitable for up to 2 cats to enjoy the finer things life has to offer. 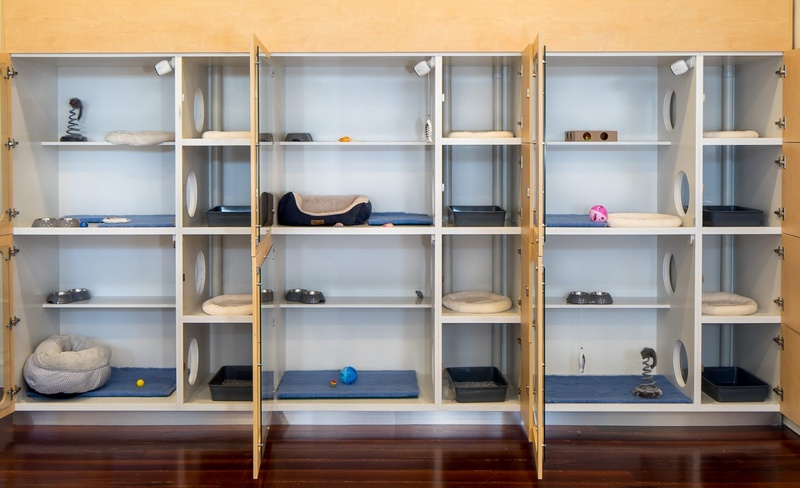 Don’t worry about your cat being in their room all day long, they will have access to our special cat run and adventure area for enrichment and exercise during their stay. Follow your cat’s holiday with our specialised Kitty Cams. Enjoy 24/7 video monitoring of your cat’s suite available to view on your computer, tablet and mobile. Watch them sleep, stretch and scratch and know they’re safe and comfortable during their stay. Access fees apply. We welcome you to tour our facilities during our open hours. Just contact us on 9404 1187 to arrange a suitable time. 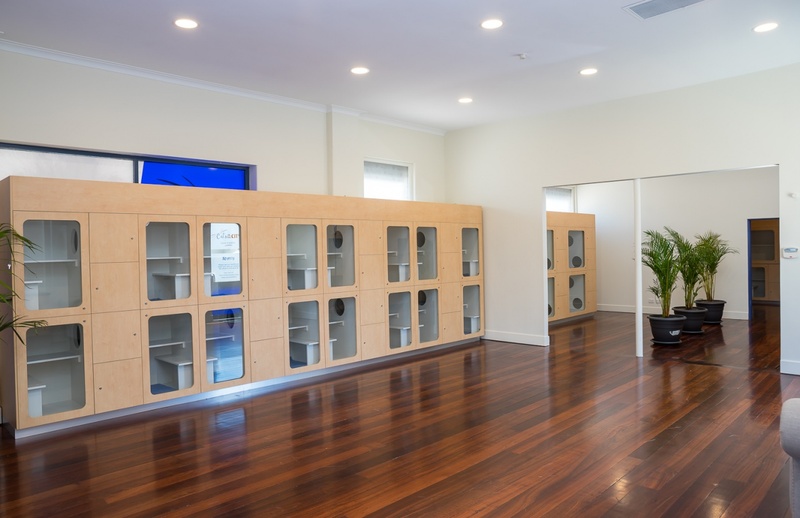 Our facilities are air-conditioned and every suite features individual air ventilation ducts to provide a completely odour free environment for our guests. To ensure the well-being of all cats, vaccinations must be current. If your cat has not been vaccinated by one of our practices, we must sight proof of vaccination before boarding your feline companion. As a general rule, cats should be fully vaccinated at least 10-14 days prior to their stay with us. If your cat needs to be vaccinated we can assist at any of our 15 Vetwest Animal Hospitals across Perth. Cancellations: Where 14 days or a greater notice is provided, the client is entitled to a full refund. Notice periods less than 14 days, conditions apply. Please call us as soon as possible on 9404 1187 if you need to cancel a booking. Just a quick note to say thank you for looking after our precious 3 cats while we were on holidays. My partner and I were very worried as to how they would handle boarding for 3 weeks (particularly Archie who is a shy timid personality) but they returned to us last Saturday so beautifully groomed and relaxed - which was further demonstrated by how quickly they all readjusted to home life. Thanks again for looking after our furbabies as if they were your own. I won't hesitate to book in the kitties for a "city break" when we next plan a holiday. "I just wanted to say thank you for looking after my pampered kitties in the ‘pawsome’ Cats in the City. I loved the cute photo cards too! The fluffs are happy to be home but I’m happy they are so well looked after.